Prepare for the coming of the Lord Jesus Christ and for the emergencies of life. Contrary to the opinion of some Christians who believe that saving for the future or making preparation is a "lack of faith", the Bible has both Old and New Testament examples of people who prepared for the future. Every family should have as a very minimum at least three days supply of food and water in case a natural or man-made disaster occurs. Resouces of the local, state, or federal government may not be able to help you and your family for several days depending on the severity of the disaster! Noah Genesis 6:5-22 Gen 6:21 And take thou unto thee of all food that is eaten, and thou shalt gather it to thee; and it shall be for food for thee, and for them. Joseph - Genesis 41:25-41 Gen 41:35 And let them gather all the food of those good years that come, and lay up corn under the hand of Pharaoh, and let them keep food in the cities. The Wise and Foolish Virgins - Matthew 25:1-13 Mat 25:3 They that were foolish took their lamps, and took no oil with them: Mat 25:4 But the wise took oil in their vessels with their lamps. The lad with the loaves & fishes - John 6:5-12 John 6:9 There is a lad here, which hath five barley loaves, and two small fishes: but what are they among so many? 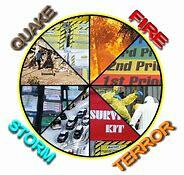 Note: See Preparedness Videos Below.